Save your CNC electronics from electrical noise failures! 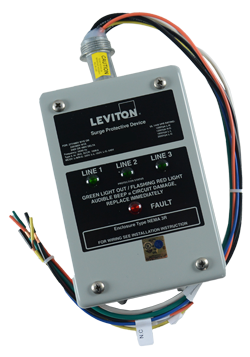 Leviton’s surge protection devices can be used for each of your CNC electronics as part of a comprehensive power management strategy. These surge protection devices divert damaging electrical noise and spikes away from sensitive micro circuitry, provide protection against catastrophic failure, prevent unnecessary repairs and costly downtime, and eliminate data disruptions. CNC grade for 208/230/277, 3-phase applications. Protecting your valuable investment in equipment from unnecessary replacement or repairs is critical, so buy a Leviton Surge Protector today and gain the peace of mind that your company deserves!